One of the world's major fairs and the largest in the Americas for the office, stationery and school sector. Escolar Office Brasil takes place annually in a strategic period for the Brazilian market. A fair focused on business, bringing together national manufactures and distributors and a signigicant number of international exhibitors from various countries, which come to Brazil in order to expand business contacts in Latin America and establish partnerships with Brazil companies. 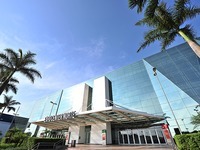 From 2017 on, it will take place at Expo Center Norte, São Paulo.